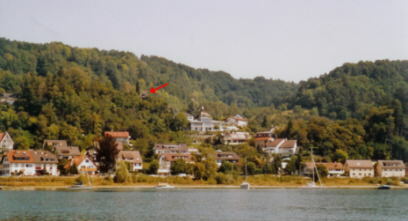 The red arrow points to the location of the house. For more click on this image, please. 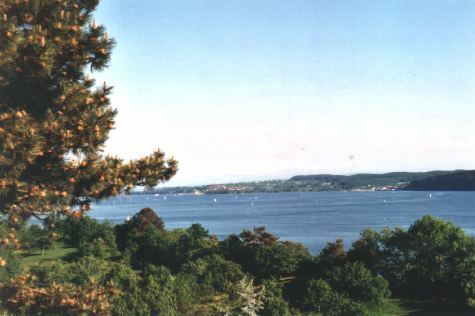 Scenic limestone cliffs dominate the scenery of the north-eastern shore of the "Überlinger See" (~ "Lake of Überlingen", a major part of the Lake of Constance). This is where "Villa Alpenblick" is situated in a serene neighbourhood, surrounded by an idyllic garden. From here you will have a wonderful panoramic view on the lake and -on days with good visibility- on the majestic Alps. Owing to local weather systems, their snow covered mountain tops sometimes seem very close, almost within a hand's reach, other times they remain far away, as a blue silhouette on the horizon.